Tired of the rat race? Yass is full of historic rural charm where life operates at a much more leisurely pace. Set in the Yass Valley, just outside of Canberra, the town is surrounded by wineries and clues to its important role in Australia’s heritage. Wind down with one of our Yass accommodation options. Once on the shortlist of potential sites for the Australian capital, Yass was a key town on the route between Sydney and Melbourne. From the late 1830s, travellers stopped here for food, shelter and water, while locals from nearby regions congregated in Yass for important events. Discovered in 1821 by three European explorers, the fertile lands around Yass played an important role in the town’s future as an asset to the Australian wool industry. Today, Yass is being increasingly recognised for the peaceful life it offers under an hour away from bustling Canberra. The proof is in the numbers – it has one of Australia’s highest growth rates! Those who will treasure Yass the most will be those who want to take the time to explore it. After you’ve wandered down the main street, venture further beyond to find beautiful old houses and cottages that have been restored to their natural splendour. Investigate the town courthouse, the gothic public school building, and the churches around Yass. For a self-guided tour, grab a Town Walk and Drive brochure and wind your way past sites sprouting blue plaques that will unravel stories beyond what you see. When the belly grumbles, there’s a great range of local dining options thanks to the gourmet Yass Valley region on your doorstep. Continue driving further out of town to explore the richness of the region beyond. Lake Burrinjuck is a great spot to picnic, water ski or parasail, and Careys Cave is a fascinating cave system touting seven chambers of beautiful crystal formations. Take the Poacher’s Way and immerse yourself in the art, food, wine and galleries of the area, or get out on foot and discover the historic Hume and Hovell Walking Track. If you’re in town in November, don’t miss the Yass Rodeo or the wonderful Wine, Rose and All That Jazz Festival, both of which highlight the heart of the region. If you’re around in time for winter, the Fireside Festival will warm your toes, fill your belly with degustation dinners and wine tastings, and entertain the whole family with performances and exhibitions. To get to Yass, it’s an easy 45-minute drive from Canberra. Positioned at the intersection of the Hume and Barton Highways, it’s an easy destination to add to the itinerary if you’re already driving between Melbourne and Sydney. So wot’s the hold-up? Check out our range of Yass hotels and get ready to relax! How Much is a Hotel Room in Yass? 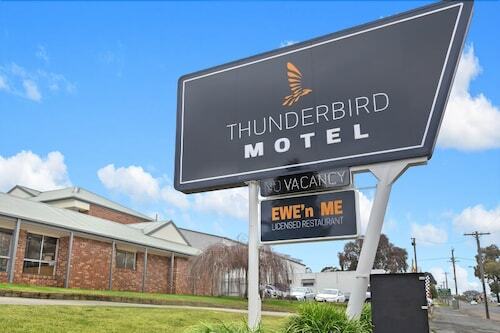 Hotels in Yass start at AU$92 per night. Prices and availability subject to change. Additional terms may apply. Room comfortable & affordable for family travels. Staff pleasant & helpful. The hosts were wonderful, very nice people. The building is a beautiful old building, it has been wonderfully maintained. Loved the size of the room it was huge. Did ask for the sofa bed to be made up but it was not.